In the city of Salamanca, Spain, there is a cathedral that was constructed in 1102 CE, making it one of the oldest in the world. 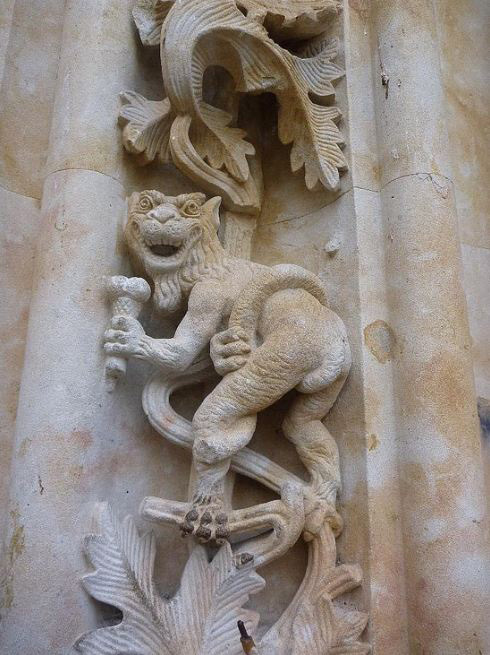 Like many other cathedrals, the walls have been decorated with many wonderful carvings of saints, demons, and various other objects... one of which is very unusual. The carving appears to very clearly be of an 20th century astronaut! How did it get there? Did a twelfth century artist predict the future? The astronaut in question, as shown above, is indeed carved into the walls of a cathedral in the city of Salamanca, but all is not as the legend represents. First, there are two cathedrals in Salamanca; the oldest does indeed date from 1102 CE, but it isn't the cathedral with the carving... the newer cathedral, built between the 16th and 18th centuries, is the one where the astronaut can be found. It's said that the astronaut was added to symbolically represent the 20th century, and that the gargoyle is a similar representation of students from the local universities. This is one of those legends that spreads readily because it has a provocative image; I will likely never find exactly where or when the story started, but a brief survey of Pinterest postings of the legend show three things. First, there were many postings, the oldest going back to 2013. Second, most of those posting had been informed of the problems with the legend, but still didn't change the story their original posts presented... so this legend will likely continue to circulate for a long time, simply because there will always be somebody who sees and reposts the older stories. Third and most sadly, the survey of pictures in Pinterest shows that the astronaut carving has degraded greatly from the image above in the past few years, with the face and right arm most damaged. This is likely either due to weather or vandalism, which is too bad... it's a wonderful carving.